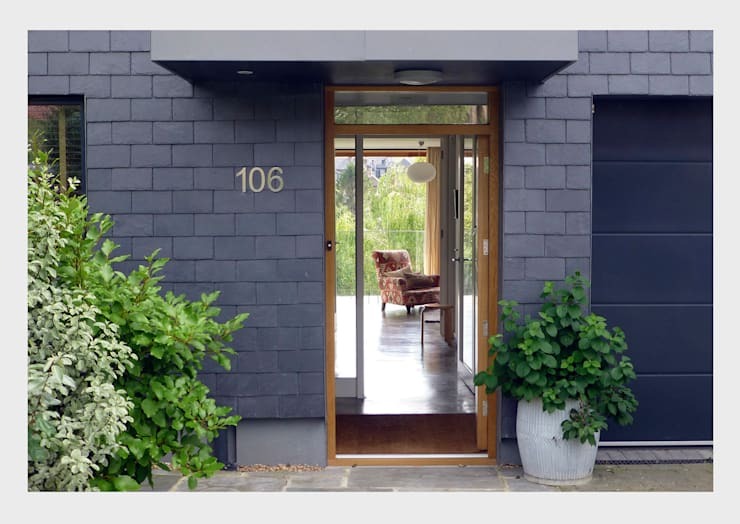 One question that is very regularly asked within the homify community is how to make a dwelling's front door stylishly stand out. The front entry to your home is surprisingly one of the most important features and elements to your abode, and therefore you need to make it count. First impressions are everything with a home, be it an inspection for homebuyers, or simply friends and family coming to visit. Given that the door is the first thing they will see, it's imperative it looks the part. You will want your entrance to look inviting, neat, tidy and fashionable. 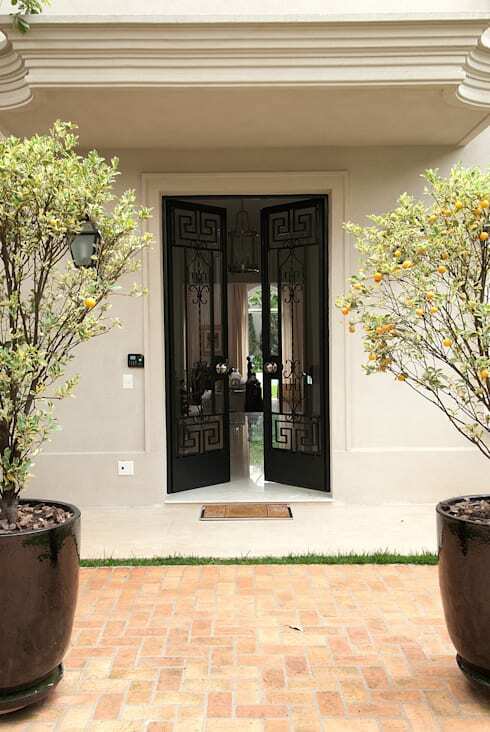 Additionally, your front door is a way to personalise your home and set it apart from the rest of the neighbouring homes. Choose individual touches that resemble your design preferences, and you will have a striking, unique, and good-looking front door in no time. Be it colour, hardware, or accessories, there are plenty of different options when it comes to renovating an existing door. Alternatively, if you are thinking of replacement, take a look at the following examples to get a little inspiration. One of the easiest ways to inject a little life and individuality into your front entrance is with a new hue. There are countless shades available, and with careful consideration, you will undoubtedly find the colour that suits your style and unique taste. If you live in an apartment building, and are unable to change the exterior hue of your door, consider looking at the inside of your home as a place to add a little interest and style. You may want to paint the interior door a bright colour to add life and energy to the entrance space. Or alternatively, if you are wary about a vivacious or vivid tone, pick something neutral such as a charcoal, beige, or light pastel. 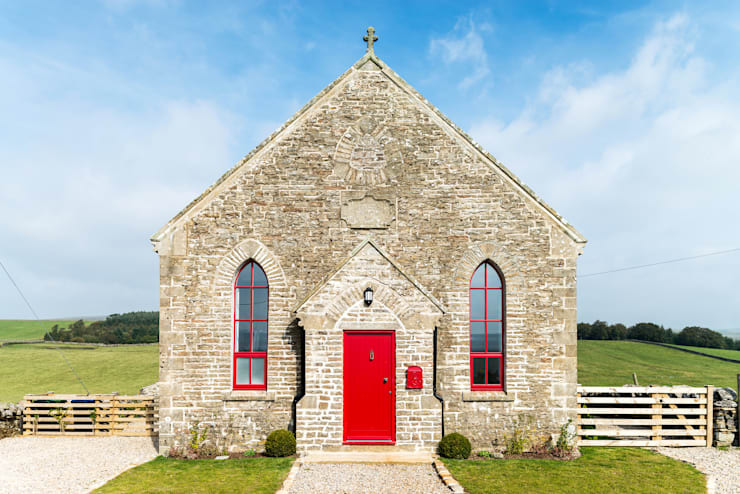 In this example we see how the bright red door personalises the home, and gives it a modern aesthetic. The red has also been coordinated with the window frames, a technique that can work extremely well in many different settings. Hardware is one of those things that is often forgotten. We tend to spend a large amount of time choosing the colour and material of the door itself, with little thought given to how we will open it. Not only does the hardware of a door add the decorative icing on the cake, but it is an integral part of the entire entry. Furthermore, an existing door can be given a fresh lease on life with some new fittings. 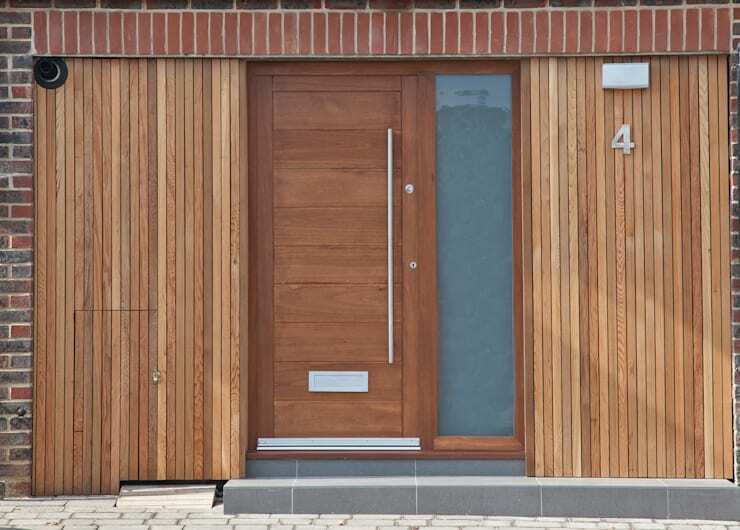 Here in this example we see a modern abode with a gorgeous timber--clad exterior, and timber door. There is a little glass panel to the right of the door, but it is the hardware that really impresses. The long and thin handle is perfectly positioned to open and close the entry with ease. Not only does it offer a functional purpose, but it looks fabulous too! If you are considering some new bits and bobs for your entrance and front door, chat to a professional, and get some expert advice. Numbers are the accessories that signify your home to guests and visitors. There is nothing more frustrating than visiting an acquaintance or friend, and not knowing which house is which. To combat this, and ensure your dwelling is noticeable, unique, and stands out, choose a bold design for your home. In this image we see a great demonstration of some sophisticated, impressive, yet understated numbers. They are affixed to the wall, indicating the dwelling, and providing visitors with practical information. Moreover, the numbers are large enough to see from the street, adding to their functionality. This entrance is fabulously bright, inviting, and works excellently to include the numbered hardware. At the homify HQ we are constantly emphasising the benefits of correctly illuminating your domestic spaces. Be it the bedroom, living room, or entrance, lighting is crucial to the overall appearance and feeling of your abode. But how to choose the right glow for your entry? There are so many options on the market, it can often be challenging knowing where to begin! Wall-mounted lights are an obvious option, along with recessed downlights underneath the porch. If you are looking for safety, consider motion sensors, and if you want something stylish, attention-grabbing and impressive, consider lights that point both upwards and down upon the wall. This will add an eye-catching detail and ensure your space is warm and inviting. In this example, the designers have also included a pair of lanterns upon the ground. This looks ultra-quaint, and works wonderfully with the wall mounted light, and the dwelling's name plate. Greenery is an often underrated accessory for the front of your dwelling. There are plenty of different options, from low maintenance plants, to interesting and unique topiary. If you live in an apartment, you can simply place a nice planter within the entry space of your home to add life and energy to the home. However, if you live in a villa, semi or detached residence, you will have numerous plant options. Here in this example we see a gorgeous manor home that has incorporated two flowering fruit trees by the front door. These trees are in pots, which allows them to be moved around depending on the style and design of your home. Additionally, the flowers emit a soft scent that will waft through the entrance space, adding to the luxury and enjoyment of the dwelling. Choose plants that suit the climate of your home. Ferns, palms, and other evergreen tropical varieties look stunning all year round, and require little care. Finally, we take a look at a home that has employed a sleek combination of stained glass, with a personalised image. 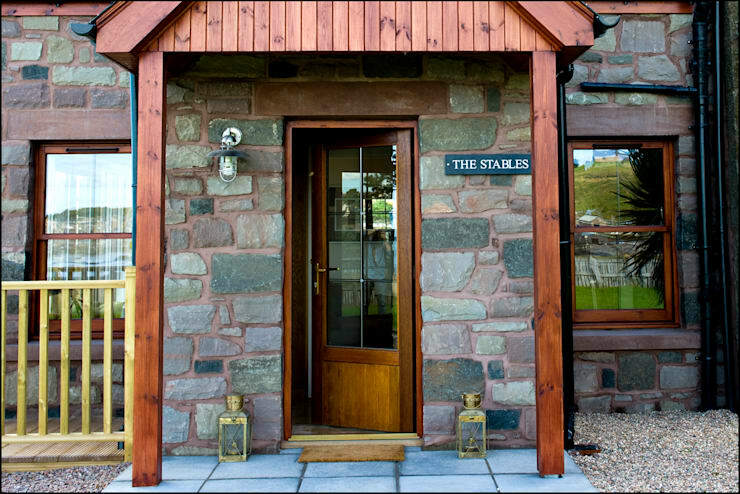 This personalisation of the owners initial, is the ultimate unique addition to a truly individual and original home. If you are considering stained glass for your entrance there are plenty of different options and designs available. Here in this example, the home is rustic and the stained glass is comprised of neutral colours. The alternative is often seen in many traditional dwellings, and features bright hues and shades that reflect the light indoors. This can look wonderful if you are trying to achieve a bright and exciting entrance. However, if you would like a more muted corridor, something similar to this example might be a good choice. How do you decorate your front door? We'd love any tips and tricks in the comments below!